A political subdivision of the State that wants to eliminate use in the political subdivision of a pesticide registered by the United States Environmental Protection Agency shall submit a request to eliminate use of the pesticide to the board. The board shall determine whether the pesticide should be further regulated based upon the board's expertise in toxicology and available scientific information relating to the adverse environmental, health and other effects of the pesticide under Title 7, section 610, 26 subsection 1. The board's review must include participation of the officers of the political subdivision and board staff and may include experts and other interested parties as the board determines appropriate. The language in the bill represents a dramatic change in the state of Maine. Local authority allows communities the authority to represent the concerns of local residents, consider the science and need for pesticides, and affirm the importance of local jurisdictions considering local environmental conditions. A recent study, Anti-community state pesticide preemption laws prevent local governments from protecting people from harm, finds that state pesticide preemption laws “compromise public health and economic well-being” by preventing localities from enacting pesticide use restrictions on private property that are more restrictive than their state's regulations. In the words of the authors, “By eliminating the ability of local governments to enact ordinances to safeguard inhabitants from health risks posed by pesticides, state preemption laws denigrate public health protections.” The study, published in the International Journal of Agricultural Sustainability, reviews scientific and historical evidence of the failure of state and federal pesticide laws to protect localities from pesticide poisoning, and highlights the inability of localities to compensate for that failure under present laws. Communities seeking to protect their residents typically issue community-wide restrictions to ensure protection of shared community resources, including air, land, and waterways, from pesticide drift, runoff, and other nontarget effects —as is the case with other community decisions on recycling, smoking, and zoning. The study's authors document how industry influence led to the adoption of state laws that undermine the ability of localities to enact protective pesticide standards they determine are necessary to protect public health and the environment. Maine Residents: Use this link to message Governor Janet T. Mills and the Maine Committee on Agriculture, Conservation, and Forestry. Non-residents: Tell the Maine Committee on Agriculture, Conservation, and Forestry that you care about this attack on public health and the environment. It is time for all local and state governments and school districts to stop the use of glyphosate/Roundup. The last month has seen a level of activity that supports immediate action. A second jury came in with the verdict that the herbicide caused plaintiffs’ non-Hodgkin’s lymphoma (NHL) —this time handing the manufacturer, Monsanto/Bayer, a bill for $80 million ($5 million in compensatory damages and $75 million in punitive damages). Tell your Governor to act now to stop the use of glyphosate/Roundup. Insurance companies are now backing away from Roundup. Harrell’s is a company that sells chemical pesticides, synthetic fertilizers, and “adjuvants and colorants,” among other products, primarily to golf courses, and to the horticulture-nursery, turf, and landscape sectors. The company announced on March 11 that it stopped selling products containing glyphosate as of March 1, 2019 because neither its current insurance company nor others the company consulted would underwrite coverage for the company for any glyphosate-related claims. The announcement stands in contrast to a Fox Business story shortly after the verdict in the Johnson v. Monsanto case. That article reported, “Top U.S. retailers such as Home Depot, Target, Walmart and Amazon are sticking by Monsanto’s controversial weedkiller Roundup one week after a California jury awarded a school groundskeeper $289 million for proving the spray caused him to develop non-Hodgkin’s lymphoma.” Indeed, insurer (and perhaps re-insurer) concern may well increase in light of the deluge of lawsuits glyphosate use has triggered. Meanwhile scientific studies linking glyphosate to serious adverse effects still keep coming in. A recent study by Fabiana Manservisi, Corina Lesseur, et al., published in Environmental Health on March 12, shows glyphosate-based herbicides are associated with endocrine and reproductive effects. This is on top of the scientific findings by the World Health Organization that the chemical probably causes cancer. A meta-study in February 2018 concluded that there is a “compelling link between exposures to GBH [glyphosate-based herbicides] and increased risk of NHL.” Still the U.S. Environmental Protection Agency fails to act. On March 1, the City of Miami established a ban, which went into immediate effect, on the use of any glyphosate-based herbicides (including Roundup compounds) by the city and any of its contractors. It is time to stop glyphosate use or risk continued exposure to the state’s populations and adverse health effects, along with the financial exposure that the threat of litigation brings. Beyond Pesticides and other organizations that have worked for many years to educate stakeholders and policy makers about the dangers of pesticides, stand ready to assist the state and communities in transforming pest management by eliminating a reliance on toxic pesticides and adopting organic management practices. Insurance companies are now backing away from Roundup. Harrell’s is a company that sells chemical pesticides, synthetic fertilizers, and “adjuvants and colorants,” among other products, primarily to golf courses, and to the horticulture-nursery, turf, and lt is time for all local and state governments and school districts to stop the use of glyphosate/Roundup. The last month has seen a level of activity that supports immediate action. A second jury came in with the verdict that the herbicide caused plaintiffs’ non-Hodgkins lymphoma (NHL) —this time handing the manufacturer, Monsanto/Bayer, a bill for $80 million ($5 million in compensatory damages and $75 million in punitive damages). Insurance companies are now backing away from Roundup. Harrell’s is a company that sells chemical pesticides, synthetic fertilizers, and other products, primarily to golf courses and the horticulture-nursery, turf, and landscape sectors. The company announced on March 11 that it stopped selling products containing glyphosate as of March 1, 2019 because neither its current insurance company nor others Harrell’s consulted would underwrite coverage for any glyphosate-related claims. Concern has increased since a Fox Business story shortly after the verdict in the Johnson v. Monsanto case, which reported, “Top U.S. retailers such as Home Depot, Target, Walmart and Amazon are sticking by Monsanto’s controversial weedkiller Roundup one week after a California jury awarded a school groundskeeper $289 million for proving the spray caused him to develop non-Hodgkin’s lymphoma.” Indeed, insurer (and perhaps re-insurer) concern may well increase in light of the deluge of lawsuits glyphosate use has triggered. Meanwhile scientific studies linking glyphosate to serious adverse effects still keep coming in. A recent study published in Environmental Health on March 12, shows glyphosate-based herbicides are associated with endocrine and reproductive effects. This is on top of the scientific findings by the World Health Organization that the chemical probably causes cancer. A meta-study in February 2018 concluded that there is a “compelling link between exposures to GBH [glyphosate-based herbicides] and increased risk of NHL.” Still the U.S. Environmental Protection Agency fails to act. On March 1, the City of Miami established an immediate ban on the use of any glyphosate-based herbicides by the city and any of its contractors. National Organic Standards Board (NOSB) meets next month in Seattle, Washington to debate issues concerning what goes into your organic food. Written comments are due April 4. The format for messaging the NOSB requires copying and pasting comments into regulations.gov, so we apologize that this is not a “single click” action. Please add a personal message about why this is important to you at the top of your comments, if possible. Lend your voice to continuous improvement by learning about issues and submitting comments to regulations.gov (directions below, or click here). From the very beginning, with the passage of the Organic Foods Production Act (OFPA) in 1990, “organic” has meant “continuous improvement ” in organic food production. The primary mechanism for this is the high level of public involvement that comes from twice-annual meetings of the stakeholder board and decisions related to the allowance of substances/materials used in organic production. The second mechanism is the sunset process, which helps move synthetic substances out of organic production as we learn more about hazards and alternatives. Those substances allowed in organic production must be placed on the National List of Allowed and Prohibited Substances and may be re-listed every five years after a mandatory rigorous assessment of their adverse effects from cradle-to-grave, and a determination of their necessity, given alternative practices and products. Imagine what could happen if pesticide registrations went through a rigorous reevaluation and relisting process like this every five years! Items on the NOSB agenda include voting on materials allowed in organic production and policies, as well as discussion of policies and sunset materials on which the NOSB will vote in the Fall. We have identified some priority issues of both kinds. Starred issues are voting issues. Then click here to go to Regulations.gov and paste into the comment field. Add a personal message about why this is important to you at the top! Silver dihydrogen citrate poses health and environmental risks, particularly the risk of increasing resistance to antibiotics and silver-based medications. Both ionic silver and nanosilver are toxic not only to microbes, but to other species as well. The petition for SDC must be denied to protect human health and the environment and ensure the effectiveness of remaining antimicrobial medications. Allyl isothiocyanate (AITC) must not be included on the National List because it does not meet any of the criteria in OFPA for allowing an exemption. It poses environmental and health hazards, is not essential for organic production, and is not compatible with organic practices. It would be difficult to find a practice less compatible with organic production than soil fumigation with a “broad-spectrum antimicrobial compound that effectively kills both plant pathogens and beneficial soil microorganisms.” Organic production uses practices that feed soil organisms who feed crop plants. It creates healthy soil food webs. Using a toxic chemical to wipe out soil biology is the antithesis of organic practices. Non-organic collagen gel casings derived from animals raised in concentrated animal feeding operations (CAFOs) contaminate organic products with toxic pesticides and other chemicals widely recognized as hazardous to farmworkers, the environment, and consumers. Any agricultural commodity can be produced organically, so listing on §606 only stifles organic production of new organic crops and promotes chemical-intensive production. Instead of petitioning for the use of casings made from meat contaminated with pesticides and antibiotics, processors should devote their efforts to eliminating practical obstacles to sourcing organic collagen. We must set enforceable, protective rules for the use of marine algae in organic production. Enforceability implies rules that are verified by on-site inspection and that will stand up to legal challenge. Rules must protect the marine ecosystem and biological communities. An annotation is the most effective way to introduce enforceable, protective rules for marine algae. Annotations are not subject to discretionary alteration without a decisive vote of the NOSB. On the other hand, because the listings are reviewed on a five-year cycle, they can be updated when needed. The Materials Subcommittee has outlined many of the issues that should be covered regarding sanitizers, but they need to be addressed within a framework that first identifies the needs for cleaning and sanitizing materials in organic production and handling. Are specific cleaning and sanitizing materials required by law? Both in terms of a strict reading of OFPA and common sense, all cleansers and antimicrobials used in organic production and handling should be on the National List. The NOSB should delist synthetic methionine (an alternative to natural amino acids) or add an expiration date to force serious reconsideration. The current listing of methionine is based on inadequate support for a regulatory decision that reverses a previous NOSB decision to phase out methionine and incentivize alternative approaches to managing poultry. The listing of synthetic methionine must be considered in the context of an organic management system. The “need” for synthetic methionine is a result of choices regarding poultry flock breeds, stocking rates (both density and group size), and outdoor access. Increasingly, consumers are turning to eggs and meat produced in pastured poultry systems, which require fewer synthetic inputs. In the time since the last consideration of synthetic methionine by the NOSB, there have been advances in the use of insects — specifically black soldier fly larvae — as a source of natural methionine. However, organic poultry producers and the NOSB should not limit their consideration to one source. EPA is misusing a regulatory loophole – the “treated articles exemption” – to allow systemic insecticides to be used in mass quantities, without regulating or labeling them as required under the Federal Insecticide, Fungicide and Rodenticide Act (FIFRA). EPA does not currently assess adverse effects on the environment and public health wrought by widespread use of neonicotinoid insecticides delivered through seeds coated with the insecticides, resulting in widespread exposure to one of the most environmentally damaging classes of chemicals on the market. >> Tell your Congressional delegation that EPA must fully regulate treated seeds to protect the environment and public health. Pesticide-coated seeds are now ubiquitous, yet their far-reaching impacts on wildlife and human health continue to go unregulated. The introduction and spread of seed-delivered pesticides to major field crops, beginning around 2003, caused a massive increase in total neonicotinoid use nationwide. 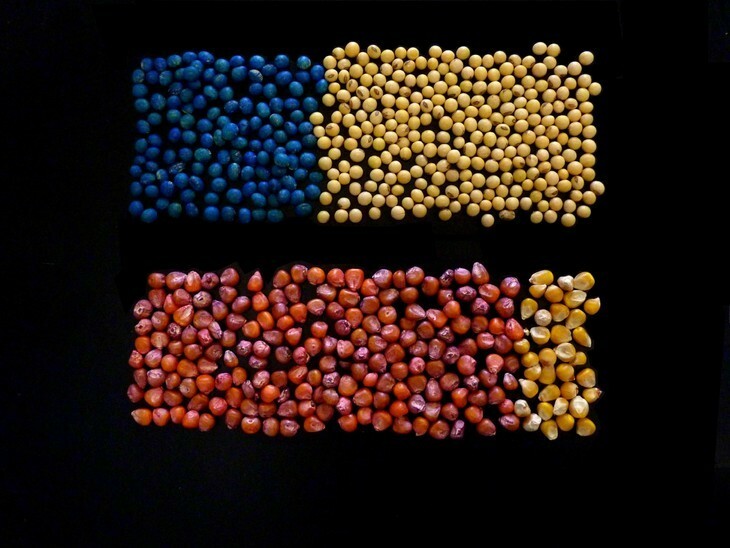 As of 2011, 34 to 44% of soybeans and 79 to 100% of maize acres were planted with coated seeds, accounting for an astounding 35-fold increase in nationwide neonicotinoid use from baseline rates prior to 2003 (Douglas and Tooker, 2015). Alarmingly, because the national pesticide survey conducted by the National Agricultural Statistics Service fails to include seed-applied neonicotinoids, their reports give the misleading impression that neonicotinoid use has declined over the past few decades. Seed coating technologies have dramatically altered the landscape of pesticide contamination nationwide. U.S. croplands are currently planted with roughly 3.5 million kilograms of neonicotinoid-coated seeds each year (Tooker and Douglas, 2017). On top of causing massive increases in the total extent and per-acre rate of neonicotinoid application, seed treatments increase the proportion of neonicotinoids applied that enter soil and groundwater. From 90 to 99% of active ingredient delivered through seed treatments is lost to air, soil, and water --including environmental losses caused by the release of contaminated seed dust during mechanical planting (Wood and Goulson, 2017). Neonicotinoids in seed dust can reach concentrations up to five orders of magnitude higher than their acute contact LD50 values, leading to documented mass honey bee poisonings (Wood and Goulson, 2017). Inaction by EPA has led state regulators to avoid investigating these bee deaths from exposure to dust from planting seeds treated with neonicotinoid insecticides. Neonicotinoid-coated seeds pose far-reaching risks to wildlife, above and beyond those posed by neonicotinoids delivered in other forms. In EPA's 2017 ecological assessment of neonicotinoids, coated seeds in particular were identified as posing the highest dietary risks to birds --exceeding the agency's level of concern as much as 200-fold. There is substantial evidence that neonicotinoid-coated seeds cause unreasonable harm to aquatic invertebrates – the foundation of healthy aquatic ecosystems. An EPA Aquatic Risk Assessment for imidacloprid, released in 2017, found that imidacloprid threatens the health of U.S. waterways with significant risks to aquatic insects and cascading effects on aquatic food webs. The continued under-regulation of treated seeds is in violation of EPA's federal mandate to regulate and fully assess the risks posed by pesticides as they are commonly applied. We must stop the expanded commercialization of genetically engineered pesticides. The failure of the U.S. Environmental Protection Agency (EPA) to fully evaluate environmental impacts of gene-manipulating pesticides raises serious concerns in light of the agency’s ongoing failure to predict ecological effects of pesticides, such as the dramatic decline of pollinators. This technology, given that it is systemic to the plant and leaves traces in the soil, can cause widespread indiscriminate poisoning—as has been seen with bees, butterflies, birds, and the larger catastrophic decline of insect populations. Tell your members of Congress that the ecological effects of RNAi gene-manipulating pesticides raise serious questions—they have not been fully studied by EPA and, until they are, the agency should issue a moratorium on their release. Previously, technical hurdles in measuring dsRNA had stymied scientists’ ability to quantify the genetic material and its degradation products in soil, but these investigators are now able to “tag” the molecule so it can be followed through a series of simulated soil systems representative of those in the “real” world. The work of these researchers marks the beginning of understanding the ecological risks of these emerging dsRNA pesticides. The dsRNA pesticides work by impeding the expression of essential proteins in target pest insects via a cellular mechanism called RNA interference (RNAi). In RNAi, the messenger RNA of the target organism (pest) is adversely affected and it is left either stunted or dead. In the biochemical genetic engineering (GE) sector, “gene silencing” technology is engineered into plants so that they can, functionally, produce their own pesticides. EPA quietly registered Monsanto’s (now Dow’s) first product using this genetic engineering technology in the summer of 2017 and it is expected to be on the market in 2019 or 2020. For decades, the silver bullet strategy to controlling the corn rootworm has eluded companies advancing approaches that do not take into account crop and soil management systems known to prevent insect problems, such as those utilized by organic farmers. Previous attempts that incorporate Bt (Bacillus thuringiensis, a bacterium that produces a toxin that kills some pests and non-pests) have been met with insect resistance over time. With the gene-manipulating pesticide, when the rootworm ingests the dsRNA in the corn plant’s tissue—grown from GE corn seeds called SmartStax Pro—a gene in the insect that is essential for rootworm survival gets turned off. Too many mistakes have been made with the proliferation of pesticides and herbicide-tolerant genetically engineered crops, resulting in harm to consumers, farmers, and other organisms. With this new study, it is clear that we know less than we should to allow the marketing of a new pesticidal plant. Given that we have the tools to grow food productively and profitably without it, there is no need for EPA to move ahead without complete understanding of serious potential hazards. Last week, U.S. Representative Earl Blumenauer (D-OR) reintroduced the Saving America's Pollinators Act (H.R.1337) to cancel specific bee-toxic pesticides and establish a review and cancellation process for all pesticides that are potentially harmful to pollinators. The specific pesticides targeted in the bill include the systemic insecticides imidacloprid, clothianidin, thiamethoxam, dinotefuran, acetamiprid, sulfoxaflor, flupyradifurone, and fipronil. The bill also establishes requirements for review of other potentially bee-toxic chemicals by an independent pollinator protection board, and requires annual reports on the health and population status of pollinators. The bill creates a sustainable model for pollinator protection in the face of ongoing obstruction by an increasingly industry-influenced EPA. There are 29 cosponsors to date. >>Tell your Representative to cosponsor the Saving America's Pollinators Act! The current bill is the fifth version of Saving America's Pollinators Act (SAPA), which was first introduced by U.S. Representative Conyers (D-MI) in 2013. The newest version differs from previous bills in its bold definition of who should have responsibility for assessing harm to pollinators. SAPA 2019 calls for the establishment of a Pollinator Protection Board, to be composed of expert scientists, beekeepers, farmers, members of environmental organizations and other key stakeholders, nearly all of whom must not have any conflict of interest or affiliation with industry. The Pollinator Protection Board would be charged with annual review of potentially bee-toxic pesticides, to ensure continued assessments the initial suspensions. Beyond Pesticides holds the position that such continuous oversight free from conflict of interest is necessary to adequately protect vital pollinators, especially in the face of worsening mass declines. The current SAPA creates a similar board structure and authorities to the Organic Foods Production Act. EPA scientists have found that neonicotinoids pose far-reaching risks to birds and aquatic invertebrates, in addition to pollinators. EPA's risk assessments find deadly impacts to birds from neonicotinoid-treated seeds, poisoned insect prey, and contaminated grasses. University researchers have found that tiny amounts of neonicotinoids are enough to cause migrating songbirds to lose their sense of direction and become emaciated. A 2018 study by U.S. Geological Survey (USGS) researchers found neonics widespread in the Great Lakes at levels that harm aquatic insects—the foundation of healthy aquatic ecosystems. Canada's pesticide regulatory agency recently proposed a phase-out of two widely used neonicotinoids, thiamethoxam and clothianidin, based on harms to bees and aquatic ecosystems. In 2018, Europe instituted a ban on neonicotinoids for outdoor use based on based on the General Court of the European Union's 2018 ruling upholding their harms to pollinators. Rep. Blumenauer is offering a legislative remedy to address the U.S. pollinator crisis. But Congress won't act unless members hear from their constituents. Read the latest draft of the bill to understand how the new act would transform pollinator protection in the U.S., and urge your representative to support the Saving America's Pollinator Act 2019. With managed honey bee losses remaining at unsustainable levels and wild pollinators and insects of all taxa at risk of extinction, it is time for the U.S. to finally protect pollinators. The bill has 29 cosponsors to date: Rep. Cartwright, Matt [D-PA-8], Rep. Castor, Kathy [D-FL-14], Rep. Clark, Katherine M. [D-MA-5], Rep. Cohen, Steve [D-TN-9], Rep. Connolly, Gerald E. [D-VA-11], Rep. DeFazio, Peter A. [D-OR-4], Rep. DeLauro, Rosa L. [D-CT-3], Rep. Gabbard, Tulsi [D-HI-2], Rep. Haaland, Debra A. [D-NM-1], Rep. Huffman, Jared [D-CA-2], Rep. Jackson Lee, Sheila [D-TX-18], Rep. Kaptur, Marcy [D-OH-9], Rep. Keating, William R. [D-MA-9], Rep. Kuster, Ann M. [D-NH-2], Rep. Lee, Barbara [D-CA-13], Rep. Lewis, John [D-GA-5], Rep. Lieu, Ted [D-CA-33], Rep. McCollum, Betty [D-MN-4], Rep. McGovern, James P. [D-MA-2], Rep. Omar, Ilhan [D-MN-5], Rep. Pingree, Chellie [D-ME-1], Rep. Quigley, Mike [D-IL-5], Rep. Raskin, Jamie [D-MD-8], Rep. Ryan, Tim [D-OH-13], Rep. Schakowsky, Janice D. [D-IL-9], Rep. Tonko, Paul [D-NY-20], Rep. Velazquez, Nydia M. [D-NY-7], Rep. Wasserman Schultz, Debbie [D-FL-23], Rep. Watson Coleman, Bonnie [D-NJ-12]. The following congress members who previously cosponsored SAPA bills have not yet cosponsored SAPA 2019: Rep. Aguilar, Pete [D-CA-31], Rep. Beatty, Joyce [D-OH-3], Rep. Beyer, Donald S., Jr. [D-VA-8], Rep. Bishop, Sanford D., Jr. [D-GA-2], Rep. Carson, Andre [D-IN-7], Rep. Cartwright, Matt [D-PA-17], Rep. Chu, Judy [D-CA-27], Rep. Clarke, Yvette D. [D-NY-9], Rep. Clay, Wm. Lacy [D-MO-1], Rep. Cummings, Elijah E. [D-MD-7], Rep. Davis, Susan A. [D-CA-53], Rep. DelBene, Suzan K. [D-WA-1], Rep. DeSaulnier, Mark [D-CA-11], Rep. Doggett, Lloyd [D-TX-35], Rep. Eshoo, Anna G. [D-CA-18], Rep. Grijalva, Raul M. [D-AZ-3], Rep. Himes, James A. [D-CT-4], Rep. Horsford, Steven [D-NV-4], Rep. Jeffries, Hakeem S. [D-NY-8], Rep. Johnson, Eddie Bernice [D-TX-30], Rep. Johnson, Henry C. Hank, Jr. [D-GA-4], Rep. Langevin, James R. [D-RI-2], Rep. Larsen, Rick [D-WA-2], Rep. Larson, John B. [D-CT-1], Rep. Levin, Sander M. [D-MI-9], Rep. Lofgren, Zoe [D-CA-19], Rep. Lowenthal, Alan S. [D-CA-47], Rep. Maloney, Carolyn B. [D-NY-12], Rep. Matsui, Doris O. [D-CA-6], Rep. Meeks, Gregory W. [D-NY-5], Rep. Meng, Grace [D-NY-6], Rep. Nadler, Jerrold [D-NY-10], Rep. Norcross, Donald [D-NJ-1], Rep. Norton, Eleanor Holmes [D-DC-At Large], Rep. Pascrell, Bill, Jr. [D-NJ-9], Rep. Pocan, Mark [D-WI-2], Rep. Price, David E. [D-NC-4], Rep. Roybal-Allard, Lucille [D-CA-40], Rep. Ruppersberger, C. A. Dutch [D-MD-2], Rep. Rush, Bobby L. [D-IL-1], Rep. Schiff, Adam B. [D-CA-28], Rep. Smith, Adam [D-WA-9], Rep. Speier, Jackie [D-CA-14], Rep. Takano, Mark [D-CA-41], Chris [D-MD-8], Rep. Vargas, Juan [D-CA-51], Rep. Waters, Maxine [D-CA-43]. A new study by Friends of the Earth and allies found that found that breakfast cereal, apples, applesauce and pinto beans made and sold by Kroger contains residues of toxic pesticides linked to a range of serious health and environmental problems. This is alarming. 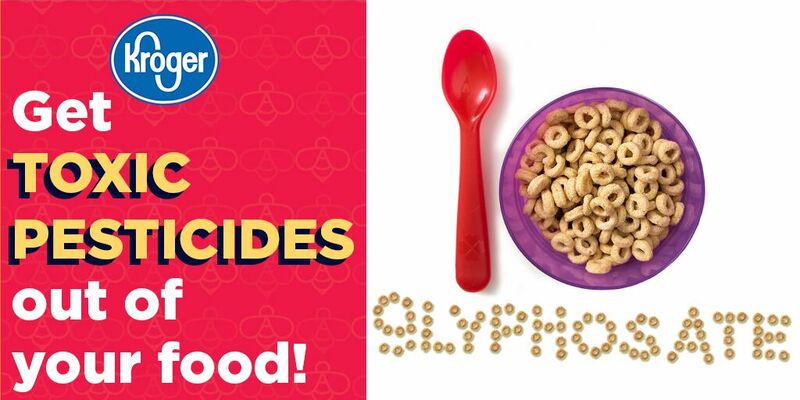 Kid-friendly food like applesauce and cheerios should not contain dangerous pesticides. Kids are the most vulnerable to these pesticides and shouldn't be exposed to brain-damaging or cancer-causing pesticides when they eat their breakfast or snacks. The connection between pesticides and cancer, learning disabilities, and other diseases is supported by hundreds of studies in Beyond Pesticides' Pesticide-Induced Diseases Database. These new tests, which corroborate numerous residue studies, mean that Kroger customers may be purchasing food with the intent of providing safe and healthy food for their families, but end up unknowingly exposing them to toxic pesticides. The pesticides found in Kroger's food are harmful to human health and pollinators. We found residues of cancer-causing glyphosate, brain-damaging organophosphates and bee-killing neonicotinoid pesticides. Organophosphates can cause damage to children's developing brains, including reduced IQ, loss of memory and attention deficit disorders, as well as acute pesticide poisoning in adults and children. They also poison farmworkers and wildlife, including pollinators, birds and aquatic organisms. Glyphosate aka Monsanto's Roundup® is linked to cancer and has contributed to the widespread die-off of monarch butterflies. Monarchs have declined by over 90 percent in the past two decades and are on the brink of extinction. Bee-killing neonicotinoids have contributed to widespread bee die-offs, which are critical to every one in three bites of food we eat and many of the foods sold at Kroger. These pesticides are also associated with endocrine disruption and may lead to changes in behavior and attention. Kroger should not be selling any food to consumers that is grown with these toxic pesticides. We know Kroger has the power to stop selling products grown with toxic pesticides. Costco adopted a policy to phase out neonicotinoids and chlorpyrifos (an organophosphate pesticide) on the fruits, vegetables and garden plants that it sells. The policy demonstrates that it is possible for supermarkets to eliminate toxic pesticides from store shelves. Kroger has no excuse. It can commit to stop stocking its shelves with food grown with brain damaging organophosphates, Monsanto's Roundup® and Bayer's neonicotinoids. We must shift the market fast if we want to protect public health and save bees and other pollinators. These dangerous pesticides can't be on supermarket store shelves. Especially the the healthiest and most affordable foods supermarkets sell. Please help us ramp up pressure on Kroger immediately to make sure it doesn't turn away from the results of this report and takes immediate action. At the request of Beyond Pesticides, the Environmental Protection Agency (EPA) has extended its public comment period on antibiotics in citrus production until March 14. With this extra time, please share this action widely to stop this threat. If you have already written your member of Congress to comment on this, please consider distributing this action broadly and submitting a comment to EPA. We have a two-part action for you to take. Use our online form to send a letter to Congress. Leave a comment on the EPA docket at regulations.gov.Please personalize our messages by adding your own story, or that of a loved one. Let your representatives and the EPA know why you want to prevent bacterial resistance! Despite the building national and international crisis of deadly bacterial resistance to antibiotics, this new allowance would expand on an emergency use decision the Environmental Protection Agency made in 2017. It permits up to 480,000 acres of citrus trees in Florida to be treated with more than 650,000 pounds of streptomycin per year; 23,000 citrus acres in California will likely be treated annually. The World Health Organization has called bacterial resistance “one of the biggest threats to global health, food security, and development today.” The two approved antibacterial chemicals to be used as pesticides in citrus production are streptomycin and oxytetracycline. Their use was permitted by the U.S. Environmental Protection Agency (EPA) under an emergency exemption in May, 2017 for a citrus greening disease caused by the bacterium Candidatus Liberibacter asiaticus (CLas) in Florida citrus crops through December of 2019. The Environmental Protection Agency announced March 15, “EPA is issuing these tolerances without notice and opportunity for public comment as provided in FFDCA [Federal Food, Drug and Cosmetic Act] section 408(l)(6).” EPA states, “[T]ime-limited tolerances are established for residues of streptomycin in or on fruit, citrus, group 10-10, at 2 ppm, and the dried pulp of these commodities at 6 ppm.” For oxytetracycline, EPA is allowing residues “in or on all commodities of fruit, citrus, group 10-10, at 0.4 ppm.” [See below; organic standards do not allow antibiotic use.] Now, EPA is moving forward with a permanent allowance of these chemicals. See Agricultural Uses of Antibiotics Escalate Bacterial Resistance. Beyond Pesticides, with other organizations, led a successful effort to remove antibiotics from organic apple and pear production because of their contribution to antibiotic resistance and the availability of alternative practices and inputs. As bacteria become resistant to the most commonly prescribed antibiotics, the results are longer-lasting infections, higher medical expenses, the need for more costly or hazardous medications, and the inability to treat life-threatening infections. The development and spread of antibiotic resistance is the inevitable effect of antibiotic use. Bacteria evolve quickly, and antibiotics provide strong selection pressure for those strains with genes for resistance. Both antibiotics proposed for expanded use are important for fighting human disease. Tetracycline is used for many common infections of the respiratory tract, sinuses, middle ear, and urinary tract, as well as for anthrax, plague, cholera, and Legionnaire’s disease, though it is used less frequently because of resistance. Streptomycin is used for tuberculosis, tularemia, plague, bacterial endocarditis, brucellosis, and other diseases, but its usefulness is limited by widespread resistance (U.S. National Library of Medicine, 2006). Exposure to antibiotics can disturb the microbiota in the gut. In addition to interfering with digestion, a disrupted gut microbiome can contribute to a whole host of “21st century diseases,” including diabetes, obesity, food allergies, heart disease, antibiotic-resistant infections, cancer, asthma, autism, irritable bowel syndrome, multiple sclerosis, rheumatoid arthritis, celiac disease, inflammatory bowel disease, and more. Furthermore, the human immune system is largely composed of microbiota. Using this form, Tell your U.S. Senators and Representative to urge EPA to reject the use of antibiotics in food production, including citrus production. You can cut-and-paste the language below (“Comment to EPA”) and submit it to the EPA docket at Regulations.gov. If you have a personal story with antibiotic resistance, please begin your comment with that. Reach out to others, including medical personnel, who can share their experiences with EPA. I write to urge EPA to reject the use of antibiotics, including streptomycin and oxytetracycline, in citrus production. This creates a public health threat that EPA must consider in real terms, as it relates to longer-lasting infections, higher medical expenses, the need for more costly or hazardous medications, and the inability to treat life-threatening infections. Antibiotic resistance is a real and urgent public health threat and represents an existential threat to modern civilization. Antibiotic resistance kills over 23,000 people each year, according to the Centers for Disease Control and Prevention (CDC). In addition to the CDC, the World Health Organization has cited this escalating problem as one of the biggest public health challenges of our time. “By 2050, resistance is estimated to add 10 million annual deaths globally with a cumulative cost to the world economy of US$100 trillion,” said Jack Heinemann, PhD, University Canterbury’s School of Biological Sciences. Exposure to antibiotics can disturb the microbiota in the gut. In addition to interfering with digestion, a disrupted gut microbiome can contribute to a whole host of “21st century diseases,” including diabetes, obesity, food allergies, heart disease, antibiotic-resistant infections, cancer, asthma, autism, irritable bowel syndrome, multiple sclerosis, rheumatoid arthritis, celiac disease, inflammatory bowel disease, and more. The human immune system is largely composed of microbiota. Note that it may not be widely appreciated that use of antibiotics on fruit trees can contribute to resistance to the antibiotic in human pathogens. The human pathogenic organisms themselves do not need to be sprayed by the antibiotic because movement of genes in bacteria is not solely “vertical,” that is from parent to progeny—but can be “horizontal”— from one bacterial species to another. So, a pool of resistant soil bacteria or commensal gut bacteria can provide the genetic material for resistance in human pathogens. Consider the real cost to the American people and internationally and prohibit the use of streptomycin in citrus production by setting a tolerance or allowable residue of zero. >> Even at tiny levels, ACP run-off and drift kills trees. Tell Oregon's Department of Agriculture to lead the country in completely banning its use. >>Tell ODA to strengthen its final rule on ACP and completely ban the chemical from use in the state! Although ODA's new rule prohibits roadside right-of way spraying, it does not ban all uses of the chemical. In effect, this is simply setting the stage for the next round of news stories picturing ACP-poisoned trees. At the federal level, Beyond Pesticides joined with our partners at the Center for Biological Diversity and Beyond Toxics to file a Freedom of Information Act request in order to get more information about this tree-killing pesticide. We'll keep fighting EPA's approval of this herbicide, but please help encourage the state of Oregon to step up and lead the way! Although the rusty patched bumblebee was placed on the endangered species list in 2017, the Trump Administration has failed to put in place legally required safeguards for the species. The U.S. Department of the Interior (DOI) must designate locations where additional protections could help restore the endangered bumblebee's population. >>Tell Your U.S. Representative and U.S. Senators to Urge U.S. Department of Interior Acting Secretary David Bernhardt to protect the endangered rusty patched bumblebee as required by law. DOI's failure to comply with requirements under the Endangered Species Act (ESA) is consistent with the Trump Administration's continued disregard for ongoing pollinator declines and environmental protections in general. Under ESA, DOI is required to determine “critical habitat” that contains physical and biological requirements a listed species needs in order to recover. That area must be designated within one year of placing a species on the endangered list, using best available scientific data. The Trump Administration's DOI has failed to do so under either former Director Ryan Zinke or Acting Director David Bernhardt. Without determining critical habitat, the administration is in violation of the ESA, and the survival of a critical endangered species is threatened. The Trump Administration has dragged its feet on protecting the rusty patched bumblebee since the beginning of its term. The species was proposed for ESA listing under the Obama Administration in 2016, and finalized in 2017 only a week before the new Administration took office. However, on his first day in office, President Trump directed federal agencies to postpone the effective date of any regulations that had been published to the federal register but not yet put into effect. This move effectively reversed the ESA listing of the rusty patched bumblebee. In March 2017, the species was finally placed onto the endangered list. Unfortunately, the Trump Administration's actions in this case are more of the norm rather than the exception. In August of last year, DOI reversed a long-standing policy that prohibited the use of systemic, bee-toxic neonicotinoid insecticides on National Wildlife Refuges. The Administration has also worked on the pesticide industry's behalf to slow down the implementation of farmworker protections and continue the allowance of another highly toxic insecticide chlorpyrifos. A September 2018 report from the Office of Inspector General (OIG) of the U.S. Environmental Protection Agency (EPA) identified issues important to protecting health and the environment. The EPA's response to the report left many of these problems unresolved. Measures and Management Controls Needed to Improve EPA's Pesticide Emergency Exemption Process (Report No. 18-P-0281, September 25, 2018), finds that the agency's practice of routinely granting “emergency” approval for pesticides through its Section 18 program does not effectively measure risks to human health or the environment. EPA disagreed and said, [T]he development of an outcome-based performance measure for the Section 18 emergency exemption process was neither appropriate nor feasible.” EPA's response demonstrates that the current Section 18 program, which allows chronic overuse of emergency exemptions, is neither appropriate nor adequately protective of public health. Beyond Pesticides has firmly opposed the current use of Section 18. Through the Section 18, or emergency exemption program, EPA allows the use of pesticides that are not registered for a particular crop, or in some cases not registered for use at all, but making progress toward registration. EPA can set tolerances for affected crops that are time-limited, usually for the season in which they are allowed or sometimes longer. For example, in March 2017 EPA announced it is allowing residues of antibiotics in Florida orange juice, after approving an emergency exemption for the antibiotics streptomycinand oxytetracycline –allowing their use for a bacterial disease, citrus greening (Candidatus Liberibacter asiaticus (CLas) bacterium that causes Huanglongbing), in Florida citrus crops through December of 2019, and further exacerbating bacterial resistance. Organic citrus growers use cultural practices, soil fertility focused on soil biology, and biological controls to manage the disease. >>Tell Congress to Ask the EPA Administrator to Close the “Emergency” Pesticide Use Loophole, and Adopt All the Recommendations of the Office of the Inspector General. Tell Congress to stop the Trump administration from opening the floodgates to permit widespread use of antibiotics in citrus production (grapefruits, oranges and tangerines). >> Tell your U.S. Representative and Senators to urge EPA to reject the use of antibiotics in food production, including citrus production. The two approved antibacterial chemicals to be used as pesticides in citrus production are streptomycin and oxytetracycline. Their use was permitted by the U.S. Environmental Protection Agency (EPA) under an emergency exemption in May, 2017 for a citrus greening disease caused by the bacterium Candidatus Liberibacter asiaticus (CLas) in Florida citrus crops through December of 2019. In addition, both the active and inert ingredients in common herbicides advance antibiotic resistance. Learn more about the history of Resistance and Antibiotics by visiting Beyond Pesticides' Antimicrobials and Antibacterials program page. Pose the question to policy makers: Will we now see an “Antibiotics rebellion”? Beyond Pesticides, with other organizations, led a successful effort to remove antibiotics from organic apple and pear production because of their contribution to antibiotic resistance and the availability of alternative practices and inputs. As bacteria become resistant to the most commonly prescribed antibiotics, the results are longer-lasting infections, higher medical expenses, the need for more costly or hazardous medications, and the inability to treat life-threatening infections. The development and spread of antibiotic resistance is the inevitable effect of antibiotic use. Bacteria evolve quickly, and antibiotics provide strong selection pressure for those strains with genes for resistance. Both antibiotics proposed for expanded use are important for fighting human disease. Tetracycline is used for many common infections of the respiratory tract, sinuses, middle ear, and urinary tract, as well as for anthrax, plague, cholera, and Legionnaire's disease, though it is used less frequently because of resistance. Streptomycin is used for tuberculosis, tularemia, plague, bacterial endocarditis, brucellosis, and other diseases, but its usefulness is limited by widespread resistance (U.S. National Library of Medicine, 2006). >> Tell your Senators and Representative to urge EPA to reject the use of antibiotics in food production, including citrus production. 01/07/2019 — Tell Your Senators and Representative: It's Time for a Green New Deal! As the dust settles on the final Farm Bill, which passed the U.S. Senate and House of Representatives last month, it is clear that neither the substance nor the process on a range of issues meet the urgent need to address key sustainability issues that put the future in peril. We must not allow this Farm Bill to be the final word on a number of critical environmental issues facing the nation and world. That is why it is absolutely critical that we get to work immediately, with the new Congress, to set a new course that transforms the institutions of government that are holding back the urgently needed transition to a green economy. >> Tell your Senators and Representative to support a Green New Deal that restructures food and agriculture programs. On the Farm Bill, our victories were mostly measured in terms of what we were able to remove from the Farm Bill—not the standard of achievement that we need to face critical environmental threats. The good. Our major victory in the Farm Bill does not move us forward, but simply protects the status quo of our democracy—protecting the power of states and local government to adopt pesticide restrictions that are more stringent than the federal government. With your help and the help of a broad network of local officials nationwide, we were able to stop a preemption provision from being inserted in the federal pesticide law. Although the victory was in defeating this provision, the chemical industry has awakened a new front in the pesticide reform movement. As a result of this provision, there is new momentum to reassert the rights of local governments and repeal state-level preemption of municipalities. Other environmental setbacks to the Endangered Species Act, Clean Water Act, and farmworker protection were taken out of the final bill. So, thank you to all who participated in this important process. The bad. We were unable to remove an amendment to organic law that introduces confusion on the mandate to sunset all synthetics used in organic agricultural production and processing, forcing the National Organic Standards Board (NOSB) and USDA to reassess the science and necessity of these inputs with the most rigorous scrutiny by requiring a super-majority vote of the board every five years to allow continued use of these synthetics—the same standard used when synthetics are initially petitioned. The growth of organic is essential to solving our key environmental challenges, from the dramatic decline in biodiversity to global climate change. Nothing should be done to undercut the integrity of the organic standard setting process. Additionally, new language in the organic law allows farmer, handler, and retailer positions on the NOSB to be filled by employees of farmers, handlers, and retailers, making the decision making process less robust. The ugly. The Farm Bill sets policy on food and farm issues for the next five years and should not be the result of backroom negotiations in Congress, as it was this round. Important and controversial issues deserve public hearings in which all members of Congress and the public can participate, and all perspectives can be heard. More on organic. There were some “wins” for organic in continued funding for programs important to organic production and research, and necessary improvements to oversight and enforcement of organic imports. New leadership. Increasing support is being shown for a proposal by U.S. Representative Alexandria Ocasio-Cortez of New York to form a House Select Committee for a Green New Deal that addresses economic and environmental reforms while ensuring a functioning democracy. A Green New Deal provides a framework for supporting agriculture that helps farmers, consumers, and the environment by advancing organic agriculture. In the words of commentator and former Texas Agriculture Commissioner Jim Hightower, “Everybody does better when everybody does better.” We need new food and farm policy that benefits all farmers and consumers.